ZOOM. 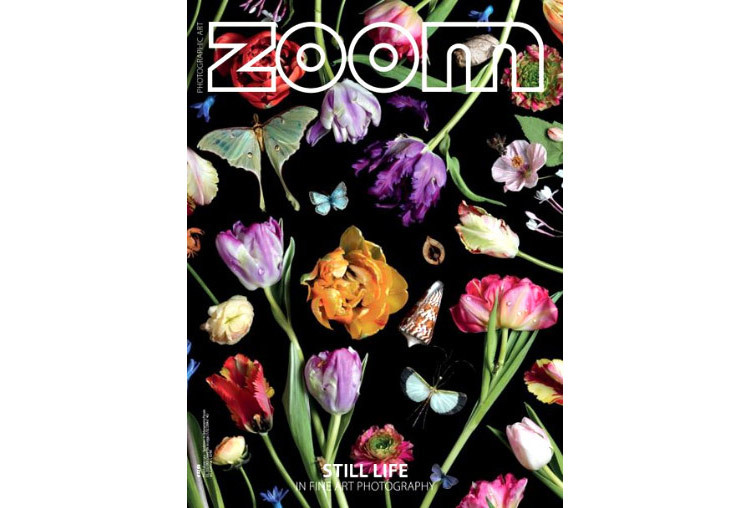 Issue 126 - STILL LIFE. In Fine Art Photography. Your still life conceptual series are different in subjects from each other, what is the common thread of your art? To some extent, the term ephemeral applies to a broad spectrum of my still life conceptual fine art photographic series. I’m drawn to capture threatened forms of human communication and knowledge dissemination, through traditional forms like paper and script, both handwritten and printed. I'm also interested in short-lived and fleeting symbols such as flowers. So I’m exploring the realms of mortality, and the transient nature of life in my art photography. Old Master works such as Vanitas Still Life, painted in 1651 by Dutch artist David Bailly have a particular existential resonance with me. Like my Postscript 2005, Hours of Devotion 2007, and Modern Myths 2010 series, both similarly explore storytelling using tangible objects, letters, books, newspapers as a means to access memories. The work implies an alternate narrative through still life forms; opening up the interpretation of an abstract image through semiotics, visual rhetoric, philosophy and mythology. Within this, both private and the public existence pass in and out of vision in my work. I use a variety of cameras and experimental methods to capture images, mixing both modern-digital and vintage-analogue, depending on the subject matter.Although it is not always practical in low light, my vintage Mamiya C330 with a top view finder, mechanically is very satisfying to use. Similarly a beautiful, if temperamental, Land Polaroid camera with bellows provides me with both a negative and instant photographic image. I work generally using large-format digital capture; shooting on location within archives. 2 Willow Road 2003, Postscript 2005, Hours of Devotion 2007 are all taken in rooms with a single light source in a controlled environment. This is evident also in my Glass Ladies Series 2016, where I worked with the Paul Laib Collection of glass negatives within The Courtauld Witt Library, London. These large, heavy glass plate negatives featured oil painting portraits from the early twentieth century and were delicately interleaved with a protective paper page torn from London telephone trade directories. The Colourfields 2014 series was shot using an early nineties Olympus IS-2000 - one of the pioneering SLR single lens zoom cameras (35-135mm for increased shooting range and depth of field). Do you avoid digitalisation, preferring to operate with objects, negatives, and the printing process? Digitalisation is important in large scale printing which means that generally I cannot avoid the digital process. My earliest object-based photographic still life series from 2003 - 2008 are predominantly digital. After 2009 I worked with polaroids for a project called Limited Time 2009, and realised then that the Polaroids were unstable. For the Hermes Baby 2011 series I created slides using digital foundry typewriter fonts which I then hand printed in a disused dark room on Bond Street, London using vintage Bromide paper stock from the 1970s, which I found on eBay. The dark room machinery then got dismantled and the parts sold to someone in Poland. Digitalisation has threatened analogue printing, making hand printing more unique but more expensive. With Colourfields, 2014, I returned to film negatives and digital printing. Then in 2016, for my Glass Ladies series, I used a high-resolution digital capture process using equipment within the Courtauld Institute of Art. Experimenting is important part of my process as well as spontaneity; capturing the moment before it disappears is key. How was the "Colourfields” series born and why did you find inspiration in John Keat’s poetry? Indirectly, Colourfields is a eulogy to my father. In 2013 he was unwell with end-stage renal disease (kidney failure). I would visit him in the Royal Free Hospital, in Hampstead, London. Nearby is Keats House a few roads away from 2 Willow Road which I visited frequently, reading John Keats (1795- 1821) poetry as a process of coming to terms with an inevitable family bereavement. The beauty and decay of the seasons, the annual cycle of renewal, the awareness of the inevitability of death seemed to be found in the landscape. So, initially I drew inspiration from my love of romantic poetry, specifically John Keats’ poem To Autumn published in1820. This I combined with photographs of flowers which I were close to my north London home in an area of regeneration around a historical river path. These newly planted wild flowers that I had photographed in summer, eventually started to lose their colour. Within 'To Autumn' I found texts such as ‘twined flowers’ and 'soft dying day' provided titles for the Colourfields series which personally resonated. Metaphorically I visualised all the millions of tiny, intertwined, filtering blood capillaries closing within the kidneys and reinterpreted them as autumnal flowers, drying out and decaying at the end of a life cycle. Where was the location of Colourfields and what flowers are they? The location of Colourfields was in Lordship Recreation Ground, North Haringey, London, by the Moselle River. In 2012 this historical area underwent regeneration and landscaping. The wild flowers and grasses planted by the river are mostly found in fields, wastelands and riverbeds. The plants I photographed are common chicory (Cichorium intybus), bird’s nest weed (Daucus carota), Curly Dock(Rumex crispus), dandelions, thistles and wild grasses. How did you choose your subjects and select your view point? It was a beautiful summer’s day in 2013. I had cycled across the small wooden bridges over the Moselle, stopping in areas where the grass had been cut to leave an abundance of wild flowers protecting the river bed. I chose a view point where the flowers had been left uncut. Where did the idea to use aniline dye inks comes from? I wanted to interact with my photography with a physical gesture using colour. My aim was to to metaphorically revive and regenerate the flora and body of the Moselle river bed landscape that remained in my memory through colour. Personal art library books on Joseph Albers Interaction of Colour (Yale University Press published 1963) and David Batchelor's Chromophobia Reaktion published 2000 provided an insightful discourse on colour theory. Colour as a cover up, a denial or embellishment interests me. I was seeking to transform the original photographic material using vibrant colour pigments. So I researched a water based ink dye that would 'bleed' through the imagery but remain transparent in places. Subconsciously I was also thinking of metaphors for arteries - systems of flowing, oxygenated rivers and contrast dyes used in angiograms. The River Moselle continues to this day to suffer from pollution and waste contamination despite regeneration intervention. Back in the 1980s, I had used iodine inks in art college, but these bottles were now old and dried out. So I purchased new inks, the most brilliant colours I could find in the art shop. They were Dr. Ph. Martin's products: pigment based, aniline, radiant dyes. The tiny, concentrated inks were in tiny glass bottles with rubber droppers. They seemed medical in application, and mixed well with the old inks, renewing and generating life back into the floral imagery creating Colourfields. Can you describe the process and on what kind of paper did you worked? I spend two afternoons in my studio using a coarse and smooth-haired brush, applying aniline coloured inks to the 6 x 4inch photographs. The paper was Fuji Colour. It was only when I looked at the intense beauty of the aniline colours on the photographs that it dawned on me that these plant and insect aniline dyes lacked permanence. The pigment of these dyes is unstable and its intensity decays rapidly through sunlight. My process was also ephemeral. Titles from Keats; poetry like ‘Soft Dying Day’ and ‘Small Gnats Morn’ seemed a poignant farewell. Remaining positive, I realised I could continue the transformation process as a symbolic attempt to capture that moment in time. By scanning the inked photographs and digitally printing them through a Durst Lambda machine, these reawakened, transient-art photographs could then be preserved as fine art photographic digital prints. The originals are safely kept in a box out of the light. Please, tell us more about the original 2 Willow Road – Revisited series. 2 Willow Road was my first series of photographic images, which won a Jerwood Photography Award in 2003. This innovative twentieth century house built in 1939 in Hampstead, London was left to The National Trust in 1996, and was formerly owned by modernist architect Ernö Goldfinger (1902-1987) and his wife Ursula Blackwell. From 1998 to 2003 I was a volunteer tour guide, and had access to their private library, which in time became the subject of my work. By photographing the books from the edges perspective, the pages became abstracted colours and geometric shapes, each image featuring glimpses of the content within. An alternative form of portraiture became apparent through the titles. Whilst spending time in the house I became absorbed in all the twentieth-century art, particularly some of the sculpture, paintings and photography that the Goldfingers had collected. I was most drawn to artworks from the British inter-war and post war years. Many of the artists featured were personal friends of the Goldfingers. Here the 2 Willow Road Re-visited images specifically reflect ten artist books from their own archive. To complete this series I successfully gained copyright permission from the Man Ray Trust ADAGP, Lee Miller Archive, Amédée Ozenfant ADAGP and The Pollock-Krasner Foundation. 2 Willow Road still remains an absorbing memory for me. My Postscript series of 2005 (which concerns hand-written letters exchanged between the American photographer and photojournalist Lee Miller and the British surrealist artist Roland Penrose from 1938-1945) was produced through access to the Lee Miller Archive, and stems from an idea I had while working at the Goldfinger house. Another body of work influenced by 2 Willow Road is About Face, 2005 - where cropped photographs of a wooden artist’s mannequin reflect on the autonomy of the surrealists female artists of the mid-twentieth century. The British artist Prunella Clough (1919-1999) interests me. In particular when she was based in Southwold, Suffolk, just after the Second World War period from 1945-1951. Her collection of objects found near the sea and harbour along the Blackshore coastline resinate with some very earlier photography of mine which I produced in Southwold around 1986. The area has gone through much change, with the once prolific fishing industry declined. I find Clough's interest in highlighting the ordinary object or unnoticed landscape resonates with me. So I plan to explore the Tate Gallery archive, and spend some time in Suffolk creating a new body of work, most probably using with my vintage Mamiya C330 camera.